I missed them in IIT Kanpur. I narrowly missed them in the Oktoberfest, Bangalore last year. NOKIA, world’s most indestructible cellphone, conceived in ancient times, forged from the volcanoes on Mount Doom (surely you have seen the e-memes on Facebook now!) is Finnish. The first thing from Finland that I consider holy. The second is the god-awesome band named Poets of The Fall. I first heard their music in the year 2007. It would be precisely 2 years after they released their first album Signs of Life. And it was right then that I turned into a HUGE FAN of their music! Not too hard, not too soft. Also, sometimes too hard and sometimes too soft. Exactly the way I like my music. So when they decided to tour India for the promotion of their sixth album Temple of Thought and included Kolkata, I sprang up to cloud nine! I had exams during which they performed in Hard Rock Café, Bangalore, the city which would usually be my venue of choice, considering it’s proximity from my University. But as my good luck was to have it, I was homeward-bound and they were going to finish off the tour in Kolkata! I couldn’t help but beg to dad, to get me the tickets for the concert – he yielded. And in some style. VIP TICKETS!! “The boys will be doing what they do best with their clothes on”, declared Marko on the stage and that’s almost exactly what they did out there! And on the blessed evening of 28th of August, 2012, the Poets ‘rocked’ Kolkata! FINALLY! Finally, an international Rock band didn’t avoid the original Rock capital of India. (Though many won’t agree, I personally believe in contemporary times, the Rock capital has shifted it’s base to Chennai, with Kerala standing up for fusion Rock and Goa still being the Indie/Jazz haven) The gates were supposed to open from 4pm and I arrived about half hour late. Suits a VIP, doesn’t it? I took my seat in the front row with the other VIPs (I won’t stop mentioning it, nope!) and as the numbers grew in the rows behind me, I decided to get to know my neighbors – Arjun, an official from Budweiser who missed the show in Delhi; Nandini, a class 8th kiddo from Kolkata, and a POTF fan (read fanatic! ); three others, I forgot their names, were from Bangalore. They had missed the show there, likewise. The hall was almost 3000 strong..
At around 6:30pm, there was a huge uproar outside and before we could dart towards the gates, I saw this hand shoot up in the air, towering way above the crowd. It was a fair-skinned, strong looking arm, with the thumb, middle and index finger curled up inside, while the fore finger and the pinky were uncurled and held straight - \m/ - the symbolism was an omen for the things to come. I suspect it was Olli, the guitar-fingered blonde. The most catchy moment in the entire thing was when everyone swayed their cellphone lights to the tunes of ‘War’, the amazing, REALLY AMAZING crowd, Marko’s dance moves for 'Sorry Go Round' – the Bossa nova version – and of course the last 2 songs! As Marko interacted more with the crowd, it was just ooh, too much fun for a day. If you were there, you'd surely remember the moment when the audience sang along 'Carnival of Rust' and the drums came on.. Aah! Nothing possibly could be better than that feeling. And in 'Illusion & Dream' when Marko, Olli, Jani and Captain came forward to literally 'raise their glasses' for us. That was something special, followed by the amazing solo ending for the same song by Olli..
Kolkata, the most unruly city known to me. I surrender, for you really RULE sometimes! Don't get excited now, I said SOMETIMES! It certainly was a dream come true, and I plan on to see them once in Helsinki itself. Someday.. Someday for sure! And I'll drag a few friends along too - they all know which ones! Blogadda.com named me as a Notable Newbie today! I'm so flattered, but never too shy to flaunt my laurels, moi. Haha! Thank you, I'm so glad you all like what I have to show. Uh, my blog posts, I mean.. Caio! Off to dinner!! 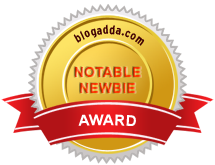 You are a newbie to blogadda.com and myself a newbie to blogging actually. Just created a new blog with some content. I will be more than happy if you run a sight over my few posts over there..